1 Swiss roll per puppy. 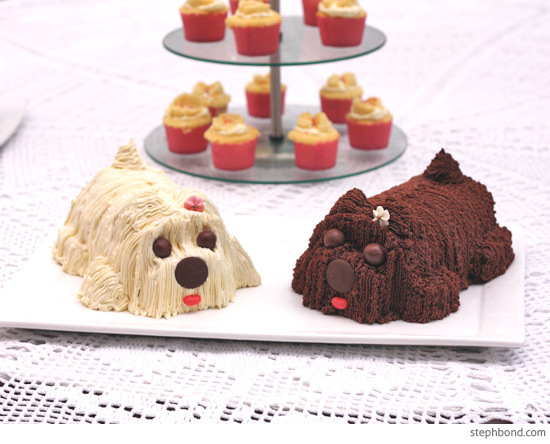 You can make these, but I bought mine from a grocery store for about $5 each; I chose lamington (vanilla sponge with jam, chocolate and coconut) for the white puppy, and a chocolate roll for the brown puppy. 1. Make up a batch of buttercream icing. I love this Best Buttercream Icing recipe. 2. 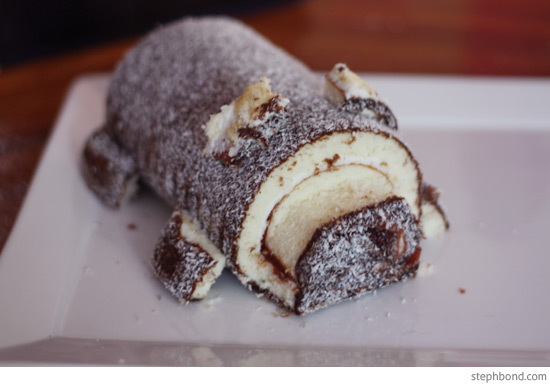 Place the swiss roll on the plate that you intend to serve the cake on. 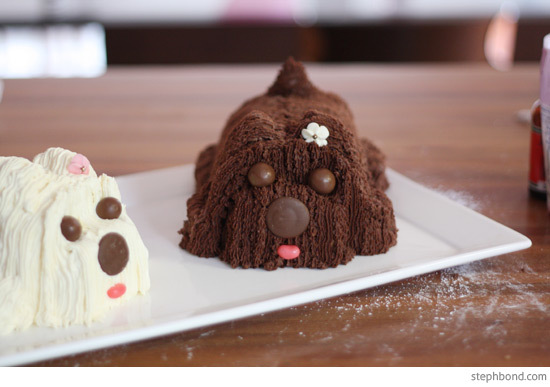 You could dollop some icing under the roll to make sure the puppy doesn't move around too much. 3. 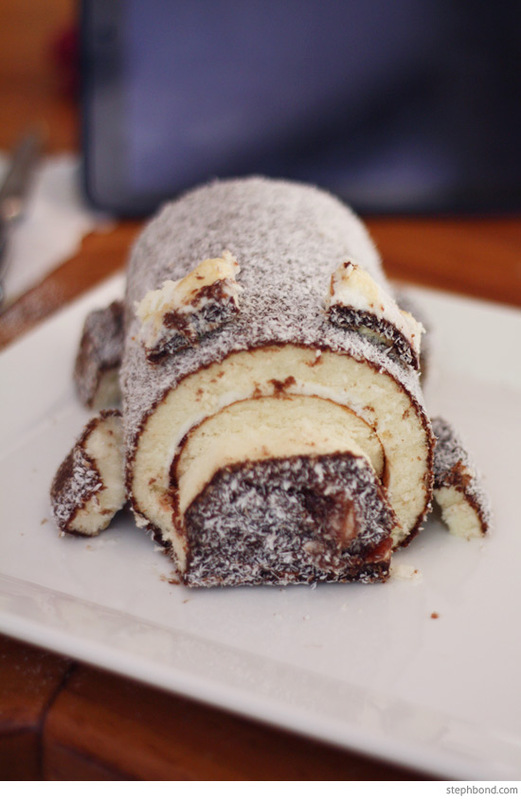 Carefully cut the outer layer of swiss roll about 2cm from the edge of the roll to make the puppy's snout. You want to end up with a remnant piece of sponge cake in the shape of a rainbow. 4. Use the remnants cut from the sponge cake to make feet and two small ears. 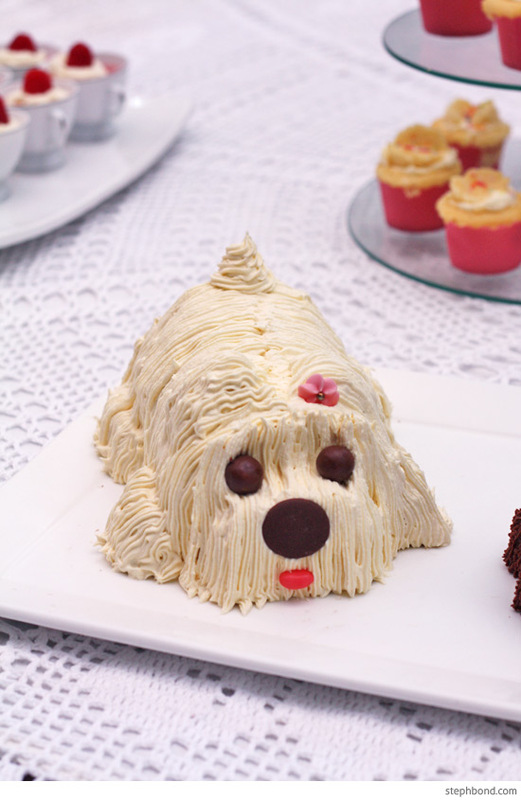 Use a small dot of buttercream to attach each piece to the side of the body and the top of the head. 5. 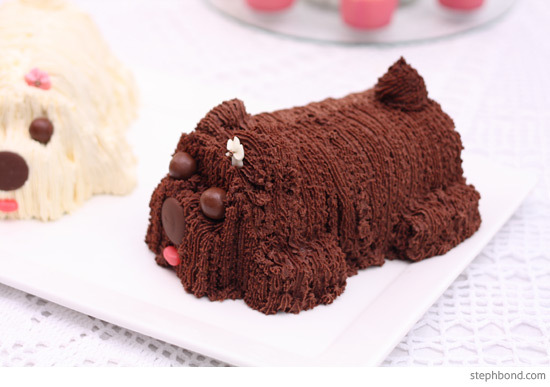 Using a small star nozzle, pipe buttercream very carefully in long strokes from the top of the swiss roll, down the side of the body, over the feet, and down to the plate to create the puppy's coat. Don't rush this part! 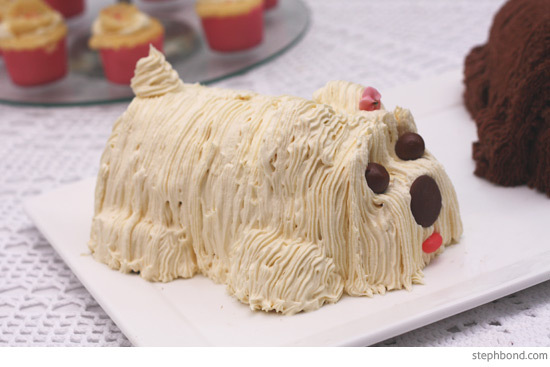 Make a swirl of buttercream for the puppy's tail. 6. Place the Maltezers on the top of the snout for eyes, use a chocolate melt for the nose, and use a pink or red jellybean for the mouth/tongue. 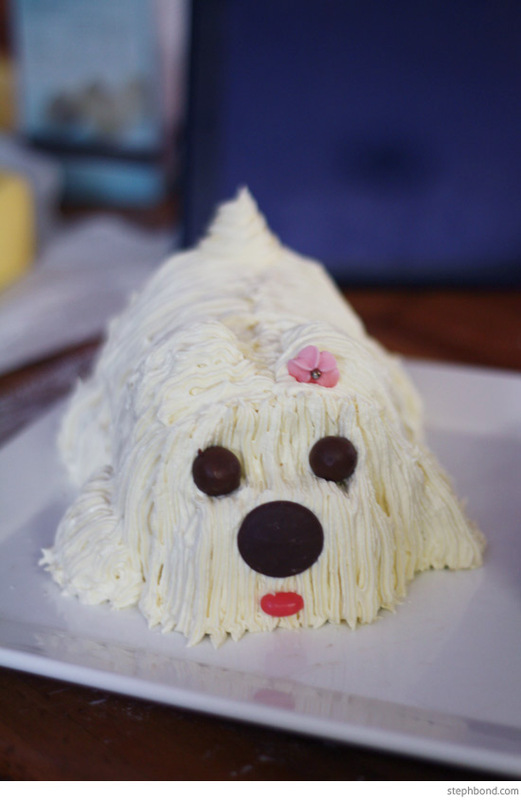 You can leave the puppy as-is, or decorate it with a little flower or bow. I had two sugar flowers on hand that I used; you could use any decoration. Just remember to remove it before serving if it is inedible. 7. 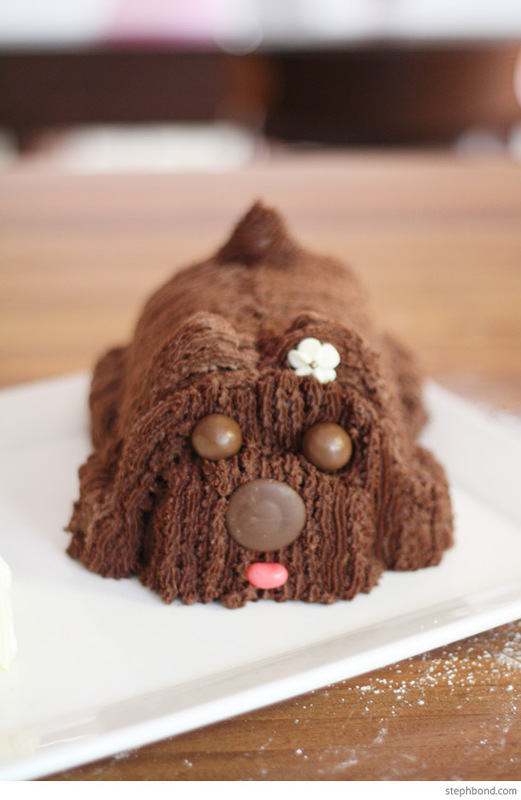 For the brown puppy, add cocoa to the buttercream mixture and repeat. 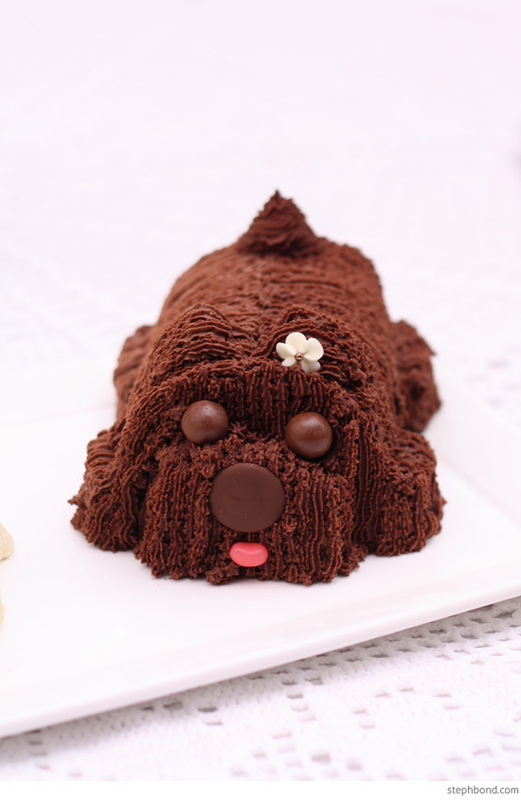 I found that the extra cocoa made the buttercream thicker, which gave the chocolate puppy a cool, scruffy texture. I liked the contrast with the silky coat of the white puppy.